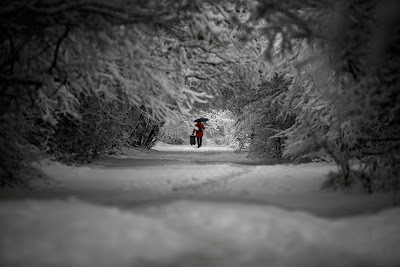 During the recent snow storms, I was housebound for many weeks except for a trip to the local post office/grocery store. It wasn't too bad - I survived. However, during this period the trash accumulating in the house began to become a problem. I have bags and bins for all sorts of recyclables; but inevitiably there is refuse I cannot recycle. The bins over flowed with plastic bottles from water, washed cat food and aluminum cans, glass jars and bottles...etc. But the worst was when the kitchen became so cold, the refrigerator shut down. The inside of the frig was warm compared to the room and everything inside grew mold: all the frozen food thawed and went bad. This made more garbage - and unpleasant at that. Outside the road was impassable. I began thinking how much waste in packaging I had accumulated from consumables in just over six weeks. Garbage is a big issue in my life - and I live a fairly spartan existence. The problem is not what to do with garbage though: the problem is how to design a system that does not produce it. 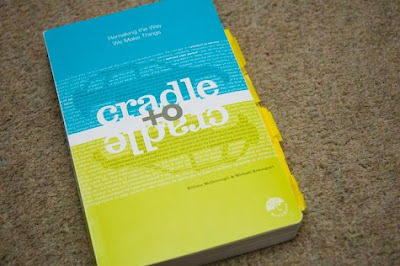 Enter 'Cradle to Cradle' (C2C) thinking. Today, with our growing knowledge of the living earth, design can reflect a new spirit. In fact, the authors write, when designers employ the intelligence of natural systems—the effectiveness of nutrient cycling, the abundance of the sun's energy—they can create products, industrial systems, buildings, even regional plans that allow nature and commerce to fruitfully co-exist. William McDonough is now working with China to help design C2C towns.